The Annapoorneshwari Temple is located at Horanadu India 100 km from Chikmagalur in the thick forests and valleys of the Western Ghats of Karnataka. Also called "Sri Kshethra Horanadu", it is situated on the banks of river Bhadra in a remote corner of Chikmaglur district of Karnataka, surrounded by the natural vegetation, forest, green lands, and natural beauty of the Western Ghats. This ancient Hindu temple of Goddess Annapoorneshwari has been restored and renamed as the Adi-Shaktyatmaka Shree Annapoorneshwari. The single image is of the Goddess Annapoorneshwari standing on a peeta with Shanku, Chakra, Sri Chakra and Devi Gayathri in her four hands. The great deity of Adishakthyathmaka Sri Annapoorneshwari's prathistapana was done by His Holiness Agasthya Maharishi several centuries back. The hereditary dharmakartharu of our family started 400 years back. Till the 5th Dharmakartharu, the temple was having a very small structure surrounded by full of natural vegetation and forest. Even then at least one or more people used to visit the temple, have pooja and were provided with free food (annaprasadam) and shelter and it is continued till date. The name Annapoorneshwari means "Feeding one and all". All who visit this temple are provided with breakfast, lunch and dinner and also tea and coffee who need. And provide place to sleep on the temple premises. Annapoorani is the Goddess who provides nourishment to all. The original temple dedicated to Goddess Annapoorani is at Kasi (Varanasi). 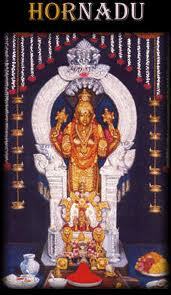 She is depicted with a bowl of annam (food) in her left hand a ladle filled with food in her right hand. Lord Siva is sometimes depicted with a bowl ready to receive food from Sakthi - Annapoorani. This depiction does not mean that Siva has been humbled as a beggar and Sakthi is the powerful provider. Hinduism is very symbolic. Several basic truths are revealed in each picturisation. Annapoorani is shown with a bowl in the left hand full of food and a laden spoon in the right hand. The full bowl shows that she has abundant supply, but what is more significant is that she has a laden spoon showing that she is always willing and ever ready to serve. All natural flow of energy is from a higher level to a lower level. The receiving hand of Siva is therefore shown lower, accepting the Sakthi for fruitful application. Also, the receiver should be aware of his needs to go and seek it at the right place. The outstretched arms means he is ready to accept and the bowl indicates that he has the means to collect and store so that the Sakthi he receives will not be wasted. When we say Brahma is the God of creation, Vishnu the God of protection and Siva the God of destruction, it does not really mean that Brahma is busy only when he initially creates the world and Vishnu only when he takes his avatars to protect or Siva only when he destroys at the end. There is no real beginning or end. The three forces are ever active, and ever present. And when it is said Siva is the Lord of destruction, it means he is ready to destroy evil and the unwanted (not the destruction of the world), getting matter ready for the process of creation and in this job Siva and Sakthi work hand in hand. Horanadu on the western ghats, situated 100 kms south-west of Chikmagalur, on the banks of the river Bhadra is a place of abundant natural beauty with thick vegetation. 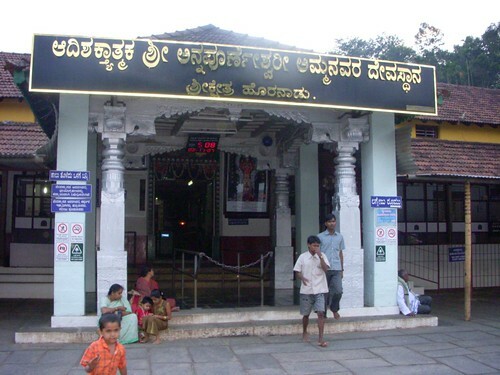 The temple for Goddess Annapoorneshwari in Horanadu, Adi-Shaktyatmaka Shree Annapoorneshwari is believed to have been built originally by sage Agasthyar. For the past 400 years, the temple is now being maintained by successive members of a family who have been instrumental in renovating the temple and performing the rites. The Goddess Annapoorneshwari is seen in a standing posture on a peeta with Shanku, Chakra, Sri Chakra and Devi Gayathri in her four hands. The uniqueness of this temple is everybody who visit this temple are provided with food (Breakfast, Lunch and Dinner) and place to sleep in the temple premises. Mahamangalarathi Time: Morning at 9:00 am, Afternoon at 1:30 pm, Night at 9:00 pm. Kunkumarchana Time: Morning from 11:00 am to 1:00 pm, Evening from 7:00 pm to 8:30 pm. Prasada Bojana Time: From 12:00 noon to 3:00 pm, Night from 7:30 pm to 9:30 pm. Note: All the above timings may vary on the special days.